The third of the trilogy of Dwight’s DVD & workbook series is finally now published, as of June 2014. It has been a privilege and a blessing to work with Dwight (z”l) on the workbooks for his video teaching series, as well as to monitor the log and “hold up his arms” at each video recording session. 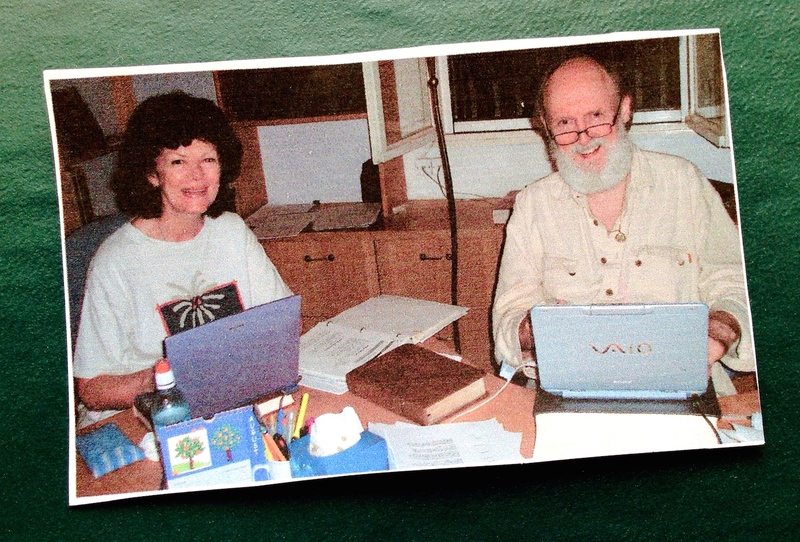 I so vividly remember the excitement of working with Dwight on the first workbook of the trilogy here in Jerusalem – “Behold the Man,” which now, praise His Name, is being taught in many countries and has been translated into Chinese and Spanish. 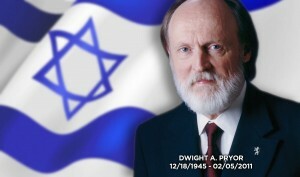 Dwight loved teaching, especially face-to-face with students – whether groups of 10 or 100 or more – but he did not enjoy writing (unfortunately). It was a joy on my part, albeit hard work, to edit the transcript and to do the layout for ‘Behold the Man’ and then ‘Unveiling the Kingdom’ and finally, with the help of dear friend Howard Graham in Ireland, as well as help with proofing by Cindy Elliot, to edit and do the layout etc., for ‘On This Rock’ – at which time, sadly, Dwight was no longer with us. May our faithful Lord continue to further the reach of Dwight’s unique teaching – for the glory of His Name and for the extension of His Kingdom. Together with family, many, many friends and colleagues from many states in the US as well as from abroad – we gathered on this Friday evening, Erev Shabbat, to pay tribute to and to celebrate the precious memory of my beloved husband Dwight Arnold Pryor. in the world whose creation God willed. and let us say: Amen. Let God’s great name be blessed for ever and ever. the Blessed One, whom yet we glorify, honor, and exalt. be fulfilled, and let us say: Amen. God, our Father, called Dwight home on a Shabbat, the time He set apart and called “holy,” so it was fitting to begin the public honoring of his memory with the special ceremony of lighting the candles and welcoming the Shabbat. Often during the dark and difficult times of life, such as the death of a loved one, we find ourselves needing to press into the pain and darkness in faith, with no clear light of understanding. We realize that the light of our earthly life is a finite flame. Like the candles of Shabbat, life is kindled; it burns; it shines; it radiates warmth and beauty, but then it fades and flickers and is no more. How blessed a people we are to know that we do not need to despair at death, for according to the promises of God in His Word and alive in Jesus our Messiah, Yeshua HaMashiach, we are more than a memory vanishing in the darkness. Our spirit lives on in all its brightness and clarity through all eternity. It also is a blessing to know that our life on earth gives life. The good, and truth, and loving-kindness we impart into the lives of others will never die. All the truth and wisdom that Dwight shared with so many in his teachings and friendly counsel will live on and continue to impart life to many more. As we kindled the Sabbath lights and saw them burn pure and radiant, we rejoiced that the memory of Dwight, treasured husband, son, father, grandfather, friend, teacher, and mentor would be for a blessing that would continue to brighten and inspire our lives. Abba, Father, we thank You for the life of Your precious son Dwight, who has entered eternity and we trust that he now has found perfect rest and peace and boundless joy in Your sheltering Presence. Together we pray the blessing of Your Shalom on each one here and on their families; the blessing of Your Shalom on this country of America, on the nations and all in government. 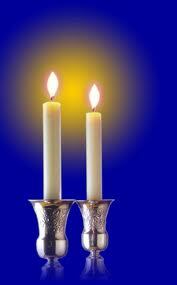 We pray the blessing of Your Shalom on Your holy city Jerusalem and on all Israel. Be their Rock of strength and refuge, and their hedge of protection always. For the glory of Your Name and Your Kingdom’s sake. After a couple years non-stop traveling and teaching – including one round-the-world adventure – Dwight and I were ready for a Sabbatical rest in our beloved Jerusalem. Arriving as we did, at the end of the long, dry summer, we were amazed at the amount of dust covering almost everything and were distressed at the amount of litter strewn almost everywhere! Once one lifted one’s eyes, however, (physically and spiritually) the unique beauty of this city was still there: the glow of the Jerusalem stone, the colorful splashes of flowers – roses, bougainvillea, geraniums, and many more – and the glorious sky with its light that seems to fall differently on this land than anywhere else. We joined our prayer to this heart’s cry as the lack of rain had brought the water shortage to a crisis level. So, once again, a needy people could only turn their minds and hearts to the One Who promised, “If you pay heed to the commandments I give you this day, to love the Lord your God, and to serve Him with all your heart and soul, then I will give the rain for your land in season, the early rain and the late rain…” (Deuteronomy 11: 13,14). And then…the first showers arrived! 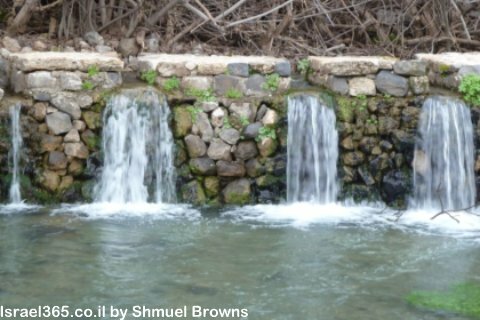 For those who live in areas of abundant rainfall and lush vegetation it must be difficult to imagine the exultation that springs up as one experiences the first rains of the season here in Israel. We awoke on Monday, 22 October, to cloudy skies and a vista washed with rain and even a few big puddles in the parking lot! Baruch HaShem! Praise His Name! In His mercy we prayed it would continue in abundance during the winter to come. The freshness and “newness” encompassing everything after the rain is a reminder of our hope in the Giver of rain and of life. What hope we have in the promise that when the King of Righteousness reigns, “…each man will be like… streams of water in the desert, and the shadow of a great rock in a thirsty land” (Isaiah 32:2). Say to those with anxious hearts, “Take courage, fear not. Behold, your God will come with vengeance; the recompense of God will come, but He will save you” (Isaiah 35:4). We have the glorious promise that when Messiah reigns as King of all the earth, the blind will see, the deaf will hear, “…the lame will leap like a deer, and the mute tongue shout for joy. 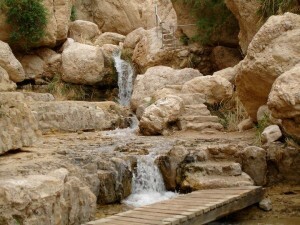 Water will gush forth in the wilderness and streams in the desert” (Isaiah35:6).